One thing Malta has going for it, perhaps unexpectedly, is speed. An excellent start to any trip. But things were to get better from there. The property, located in the culturally vibrant and historically important St Julian’s, is a destination in its own right, gifting leisure travellers an idyllic setting for their year-round breaks. 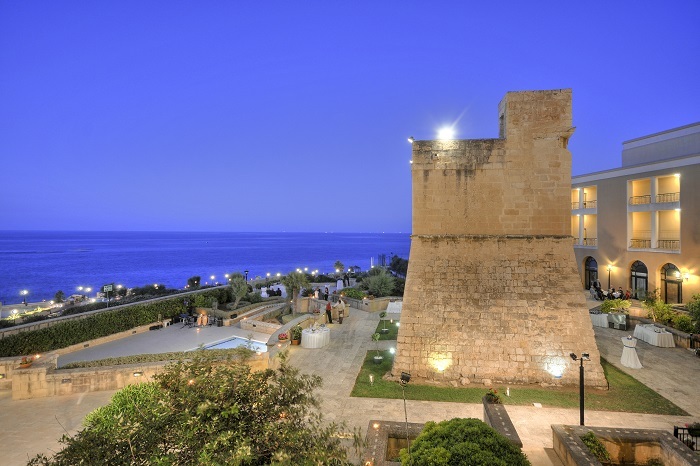 Corinthia Hotel St George’s Bay was built around one of the thirteen 17th century watchtowers constructed as a gift to Malta by the Aragonese knight Martin de Redin when he was elected grand master of the order of St John in 1657. The site also formerly housed a section of a 19th century British military base, parts of which still stand and are home to the Institute of Tourism Studies opposite. Today the property offers the perfect balance of tranquillity, panoramic views, culinary delights, and leisurely activities, boasting 211 rooms, across basic and executive levels, and 38 suites. Accommodated in an executive room, my balcony opened up to offer views right across the famous bay below. 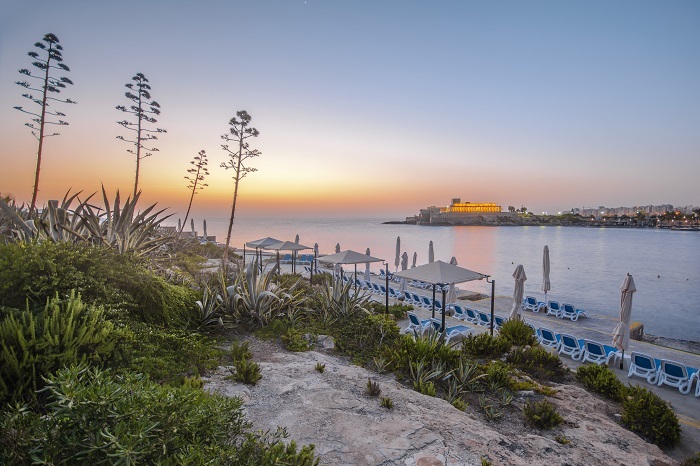 The hotel itself is situated right on the water, with the edge shaped like a classic bastion fort, jutting star-shaped into the Mediterranean Sea. Here waves crash against the lido, a rocky outcrop encouraging braver visitors to take a dip in the admirably blue seas. For more sedate travellers, one of the features of the hotel is its large and attractive cascading outdoor pool complex, flowing all the way down from the hotel to the beach. On the water Corinthia offers a wide range of sports, including a jetty and a fully-fledged PADI diving school. During the summer months, guests have a chance to experience a vast array of special experiences sourced form the best Malta has to offer - from swimming with dolphins to dinner on a private yacht in the grand harbour. Back upstairs on the executive floor, guests are welcomed in a separate reception, while a club lounge ensures convenience, privacy and comfort, while also offering an early evening cocktail hour. The clientele is largely British – given the colonial connection between the two islands – but a growing number of Germans, Italians, and Spaniards now visit, diversifying Corinthia’s markets. All come for the sunshine, beaches, and diverse cultural offering. Indeed, Corinthia Hotel St George’s Bay overlooks the bay where the famous Santa Marija Convoy - a British operation to carry supplies to the island of Malta in 1942, during the Second World War - landed. History buffs will also be keen to learn about Napoleon’s arrival on the island, again in the nearby bay. All this and more can be explored by bespoke tours offered by the hotel. Out by the shoreline, Corinthia Hotel St George’s Bay is a gastronomic hub and hive of entertainment, offering nine restaurants and bars ranging from fine dining to casual Italian - inside or under the stars. Guests will be spoilt for choice when it comes to choosing the best option. From the varied buffet experiences at the Fra Martino Restaurant, fine dining at Caviar & Bull, to a taste of Italy at Da Marina restaurant, French specialities at the Vinotheque Bistro and amazing grills at Henry J Beans’ American style bar and grill, there is plenty to keep the discerning traveller occupied. For business travellers, the hotel boasts extensive conference facilities. The self-contained events hall offers total flexibility for events of up to 600 delegates or banqueting facilities for up to 1,500 people. All meeting rooms are fully equipped with the latest audio-visual equipment, with the business centre providing a complete range of additional secretarial services. The hotel also has an indoor pool, health spa and gymnasium. 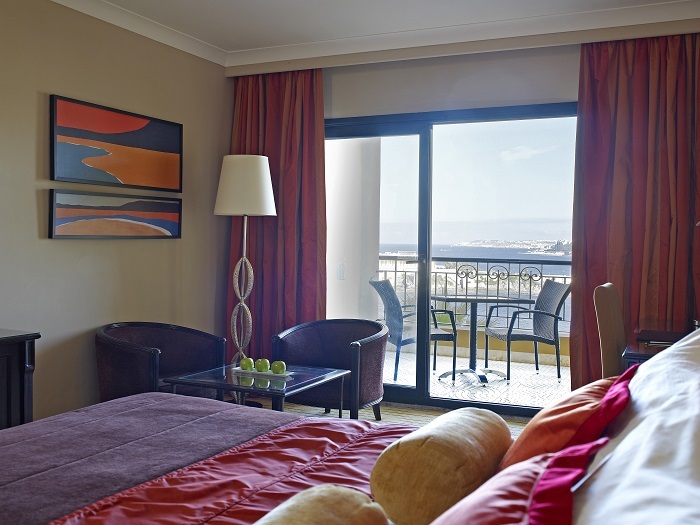 Corinthia Hotel St George’s Bay is the complete package for any visitor to Malta. Corinthia Hotel St George’s Bay forms part of Malta’s leading upscale international brand, Corinthia Hotels. Opened in 1995, the Corinthia St George’s Bay was created with a passion for craftsmanship and an understanding of world-class service. The hotel was the first of a new series of deluxe five-star properties build on Malta’s golden accommodation belt centred on St. Julian’s, offering excellent leisure, conference and dining options to both local and international clients. Find out more about the hotel and the brand on the official website.